This year’s Smart Energy Talks event is designed to help you identify and correct barriers to your health and comfort at home through presentations, demonstrations and discussions with experts. The free event is scheduled for Saturday at the Milo Bail Center on the University of Nebraska at Omaha’s Dodge Street Campus near 62nd and Dodge Streets. Starting at 9 a.m., author and lecturer Corbett Lunsford will present his “Home Performance Crash Course” — a 90-minute presentation about improving performance in existing homes and how to build a healthy, efficient new home. Lunsford will also discuss and show video of his #TinyLab — a 210-square-foot home. Attendees will receive a free “Proof is Possible” workbook written by Lunsford. Click here for additional event details and opportunities. 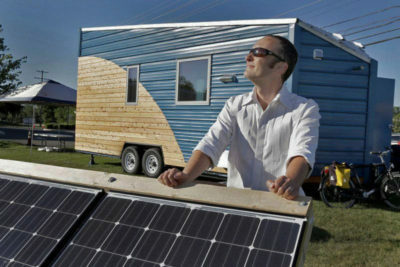 Photo: Corbett Lunsford poses near his #TinyLab and an array of solar panels. Lunsford will speak Saturday during the Smart Energy Talks at the University of Nebraska at Omaha’s Milo Bail Student Center. This entry was posted in Energy Conservation, Nebraska / Midwest News, NewsBlog, Solar Energy Education and tagged free event in Omaha, Free Home Performance Crash Course - Corbett Lunsford, Mike Whye, Nebraska Community Energy Alliance, Nebraskans for Solar, Omaha World Herald, Smart Energy Talks, tour on October 31, 2016 by Helen Deffenbacher.